For the Advanced Hardwood Biofuels Northwest (AHB) conversion team, sugars and how they are treated are pivotal to producing several vital products from poplars. “Sugars are the key,” said Shannon Ewanick, instructor and researcher at the Biofuels and Bioproducts Laboratory at the University of Washington (UW). Ewanick oversees the steam pre-treatment reactor also known as the steam gun. “The pre-treatment process breaks down the fibers of the poplar resulting in a slurry of solids and liquids. The liquid stream goes directly to the fermentation stage, while the solids go through hydrolysis to be even further broken down before fermentation which produces different products including ethanol and acetic acid,” Ewanick explained. Shannon Ewanick explains the operation of the steam pre-treatment reactor. 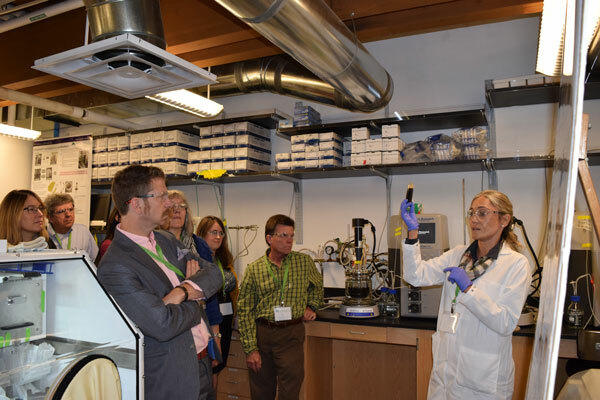 Ewanick and the UW conversion team led tours through their labs as part of the AHB annual meeting in Seattle September 8 – 10. The five-year USDA National Institute of Food and Agriculture-funded project is now in its final year with a consortium of ten academic institutions and private companies sharing results and finalizing research projects. The conversion team’s research has many components, including fermenting sugars to make acetic acid used in plastics, paints, and road deicing materials. “We can also hydrogenate the acetic acid and make ethanol to mix with gasoline,” said Fernando Resende, assistant professor at the UW School of Environmental and Forest Sciences. Resende explained that we can also use the ethanol to make ethylene, which is the world’s largest commodity chemical used to make a variety of plastics. The ethylene can be further converted into bio-jet and diesel fuels. “Having that type of flexibility in terms of the products we can make greatly increases our chances of success in different economic scenarios,” said Resende. Azra Suko describes her conversion work to participants on the lab tour. Results in the UW labs are provided to the AHB sustainability team, which does techno-economic analysis and life cycle assessment work relating to economic viability and environmental impacts. 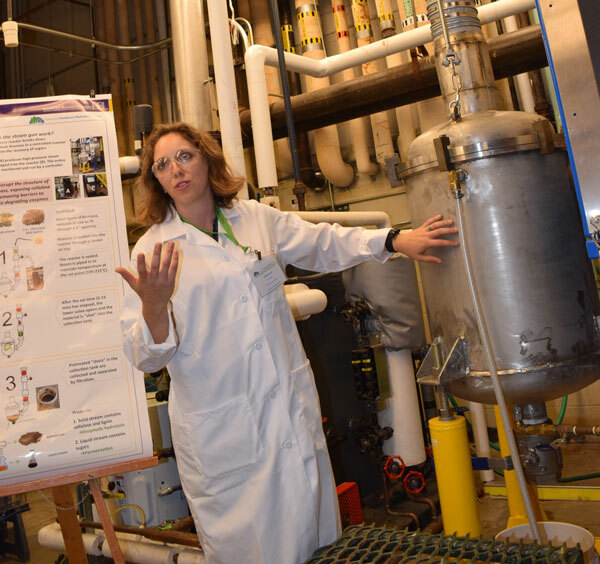 Lab findings are also tested at a demonstration biorefinery run by industry partner ZeaChem in Boardman, Oregon. ZeaChem is set to break ground on the world’s first wood-based cellulosic ethanol production facility in 2016.